"They invented a game on top of the game." Prolific filmmaker Steven Soderbergh continues his experimental tricks in the pro basketball lockout drama, High Flying Bird. Shot on an iPhone and set around the antagonistic world of sports managers, it's a searing, incisive look at how athletes are commodified and inventively explores divides in the business world while slyly commenting on the disruptive nature of the current film industry itself. Unfolding like a heist film, André Holland's electric and charismatic as all hell performance in that of basketball agent Ray makes High Flying Bird definitely feel like a set plan in motion told by a master. The entire film is an extended metaphor for disruptive media. As a well-known adaptive filmmaker and innovator himself, Soderbergh relishes in embracing new forms of experimental technology to bust the status quo and traditional media gatekeepers. The film's plot replicates this sense of thoughtful endeavour and innovation as Ray uses his influence as a power broker to manipulate new money success in an old money world. Social media and streaming video are used as a threat against the power of traditional media and a monolithic brand like the NBA. Moonlight playwright Tarell Alvin McCraney's cleverly lean script feels so effortlessly breezy despite its sharply dense material. Shaped like a bare stage play using performance and dramatic tension to construct its moving narrative, the tightly-filmed story feels like nothing else combining its theatrically with other documentary and sports influences together through Soderbergh's use of digital cinematography. 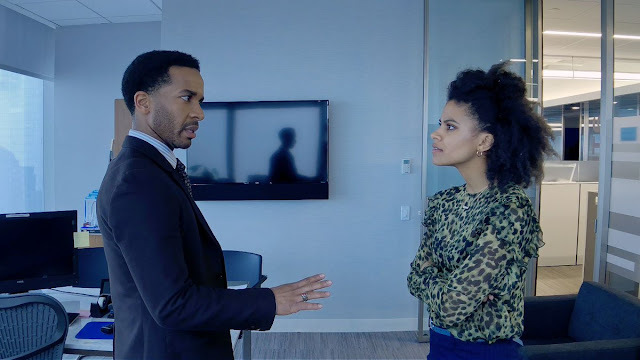 The always compelling Zazie Beetz provides another captivating yet elusive performance full grace and appeal as Ray's loyal, no-nonsense assistant. Melvin Gregg ably plays a trouble rookie lacking discipline as Ray's troublesome client and first-overall NBA draft pick unable to play. High Flying Bird will be available for streaming on Netflix starting February 8th.